Wilson Kipsang, who set the world marathon record in 2013 and beat a strong field to win the London marathon in 2014, won the 2014 New York marathon in an epic battle with Lelisa Desisa of Ethiopia. In the process, Kipsang won the world marathon series which comes with a prize of US $500,000 in addition to the $100,000 he earned for winning the New York marathon. In cold conditions that were in the range of 45 fahrenheit (7 celsius), Kipsang and Desisa went neck and neck over the last mile. 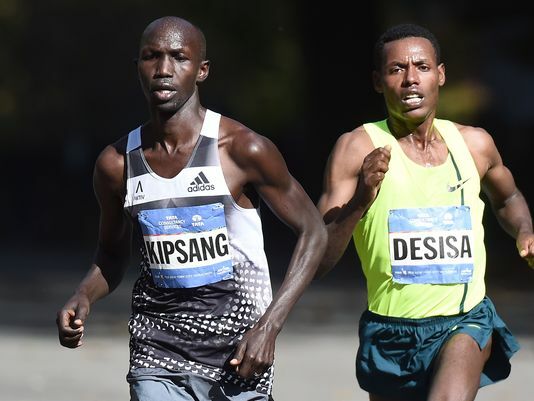 Kipsang led coming back into the Central Park as they approached theas they neared central park, then Desisa fought back and took the lead. Kipsang then put in one final surge to win in 2:10:59. This entry was posted in Kenya Athletics News, Kenya Sports news and commentary and tagged Kenyan marathoners, New York Marathon, Wilson Kipsang. Bookmark the permalink.